In the process of mining, it is critical to reduce power consumption and upfront costs to install the mining systems. In a typical datacenter build, nearly 60% of the cost of building a datacenter goes to electrical systems needed for power delivery. We, as miners, need to take care to reduce this expense as much as possible to get the best IRR as possible on our investment. Since downtime is less critical, typical HPC datacenters limit or completely eliminate both battery backup systems and redundant power. Most of you are probably familiar with a battery backup system that is used in a home or small office. 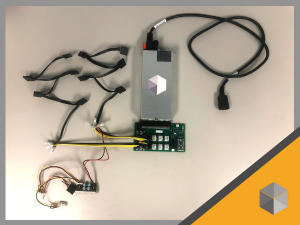 These systems will take AC power coming into them to charge a battery, and if the AC power goes out, the battery will be used to power an AC Inverter to generate AC power to run your computing HW until the AC power returns. In large, datacenters’ battery backup systems do not need to run for an extended period of time since they really just bridge the gap between the power failure and backup generators kicking in. This will happen in a minute or two after a power failure. In a datacenter, redundant power is a design where every piece of equipment has power coming from two separate breaker panels, typically referred to as an A and B panel. This ensures that if there is any problem in the power delivery system for one panel then the other panel will take over. This requires that your computers either have redundant power supplies with one plugged into the A panel or the other into the B panel. If that is not an option, then a device called an automatic transfer switch (ATS) can be used to detect a failure in the primary circuit and fail over the secondary circuit. Redundant power does not help if you overload that circuit, since once the A panel breaker trips you would fail over the B panel and trip the breaker in that panel also. However, if the actual breaker in panel A fails then this failover would avert a problem. 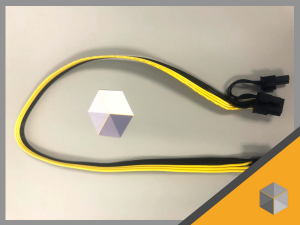 Furthermore, this A+B power becomes critical in a datacenter where there will be constant maintenance and upgrades happening to power infrastructure. This failover allows the datacenter to be able to take down circuits so that staff can safely work without the need for systems to have any down time. However, redundant power more than doubles the cost of installing the electrical infrastructure needed. Not only does every piece of equipment in the plant need to be doubled, but to fully be redundant this needs to go as far back in the grid as possible. For a small data center, that means that you might have one power meter and then everything splits in two from there. But in a large data center, they will look to have multiple sources of power into the building. 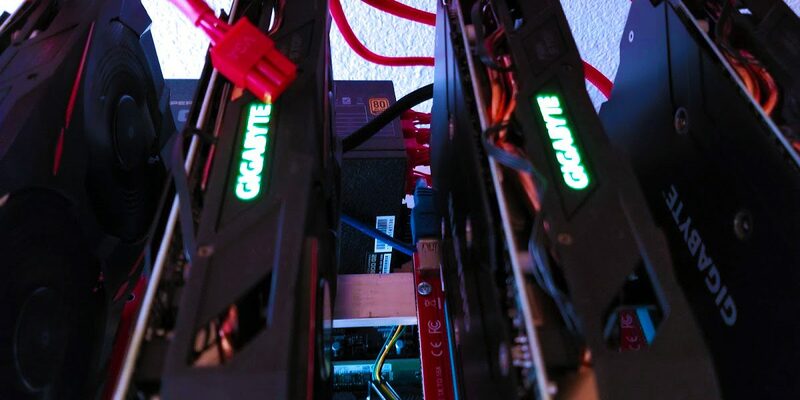 So, in mining like HPC, we look to eliminate redundant power for all miners. There may be certain critical infrastructure pieces that remain with redundant power and/or battery backup systems. These could include network infrastructure and central servers. Your typical computer power supply is something called a Switching Power Supply. This is a technical term for a power supply that doesn’t use a transformer to convert power, but instead, an array of transistors that turn on and off very quickly to maintain a lower voltage than the input to the power supply is. In computers, that main output voltage is 12 Volts. The benefit of this design is that these power supplies are much more efficient than one that’s based on a transformer. They are also much smaller and cost-effective to build. The switching design of these also means that these power supplies can handle a large variant in the input voltages and still produce quality voltage output. However, the higher the input voltage, the more efficient they are. So, while many computer power supplies can run at 120V input, they will run significantly more efficient with 208V or 240V input. In fact, if they are designed to run at 277 Volts, they can achieve an even, high efficiency. Most PSUs these days are not designed to run on voltage higher than 240V, but with a drive for more and more efficient datacenters, both Dell and HP have made PSU capable of running off of 277 Volt power. See Also: 277 Volts to Your Server? As we discussed in our Industrial Power Basics blog entry, your typical medium to large industrial building has 480V/277V power from the utility company’s transformer. The typical way to power a computer from there is to convert that power down to 208V/120V via a transformer and power the computer off of the 208V power. This gives you compatibility with most computer PSUs and also uses the 208V voltage for more efficiency over 120V. However, this means you need to send all of your power through a transformer. That transformer loses about 3% of its power to heat. Furthermore, the switching mode PSU can add another 1.5% increase in efficiency. There are other benefits as well in reduced cooling cost. At the end of the day the use of 277V power to the miners can save over 5% in energy costs. 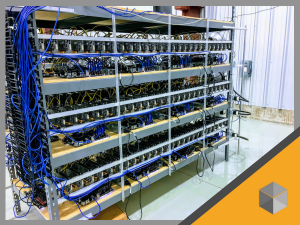 With these innovations we believe we have one of the most efficient datacenters for cryptocurrency mining. We are happy to share our design with customers and allow them to build operations that are equally as efficient.